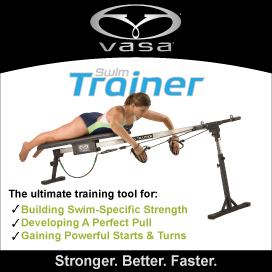 Most swimmers complete the entry phase in backstroke as soon as the arm breaks the surface of the water – that is, the speed of the arm slows down as the arm submerges, and then the arm begins moving laterally. This is counterproductive for three reasons: 1) loss of hand speed, 2) wasted time, and 3) misdirected force. For an effective backstroke arm entry, the hand must submerge below the level of the elbow and shoulder. If the arm entry is synchronized with the torso rotation, both technique elements will likely improve. Once the hand is the deepest part of the arm, the arm will be in a stronger position to begin the pull by flexing the elbow.